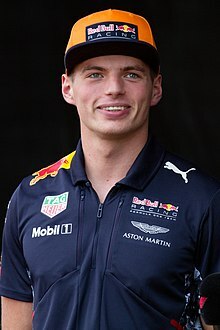 Max Emilian Verstappen (Dutch pronunciation: [mɑks eːˈmilijɑn vɛrˈstɑpə(n)]; born 30 September 1997) is a Belgian-Dutch racing driver who competes under the Dutch flag in Formula One with Red Bull Racing. Aged 17 years, 166 days, he became the youngest driver to compete in Formula 1 at the 2015 Australian Grand Prix. He also holds eight other "firsts" in Formula One racing. After spending the entire 2015 season with Scuderia Toro Rosso, he started his 2016 campaign with the Italian team, before being promoted into Red Bull Racing mid-season as a replacement for Daniil Kvyat. He won the 2016 Spanish Grand Prix in his debut race for Red Bull Racing at the age of 18, becoming the youngest-ever winner of a Grand Prix and the first racing under the Dutch flag. He is the son of former Formula One driver Jos Verstappen. Max Emilian Verstappen was born on 30 September 1997 in Hasselt, Belgium. His family has a long association with motor sports: his father, Jos Verstappen, is a Dutch former Formula One driver, his Belgian mother, Sophie Kumpen, competed in karting, and his uncle, Anthony Kumpen, competed in endurance racing and is currently a NASCAR Whelen Euro Series driver. Although Verstappen resided in Bree, Belgium, he decided to compete with a Dutch racing licence because he "feels more Dutch", spent more time with his father than with his mother owing to his karting activities, and was always surrounded by Dutch people while growing up in Maaseik, a Belgian town at the Dutch border. He competed in Formula One for more than half a season before obtaining a road driver's licence on his 18th birthday. Verstappen has lived in Monaco since October 2015, claiming it was not for tax reasons. Verstappen began karting at age ​4 1⁄2. He competed in the Mini Junior championship of his home province of Limburg (Belgium). In 2006, Verstappen graduated to the Rotax Max Minimax class and won the Belgian championship. In 2007, Verstappen won the Dutch Minimax championship. Racing in a CRG kart entered by his father, Verstappen won the Dutch and Belgian Minimax championship as well as the Belgian Cadet championship. In 2009, Verstappen joined Team Pex Racing, a CRG customer team. That year, he won the Flemish Minimax championship and the Belgian KF5 championship. In 2010, Verstappen stepped up to international karting. He was signed by CRG to race in their factory team at world and European championships. At the KF3 World Cup, Verstappen finished second to the more experienced Alexander Albon but beat him at the WSK Euro Series and also won the WSK World Series, beating Robert Vișoiu. In 2011, Verstappen won the WSK Euro Series in a Parilla-powered CRG. In 2012, Verstappen was picked for the Intrepid Driver Program to race in the KF2 and KZ2 classes. He won the WSK Master Series in the KF2 class, beating CRG driver Felice Tiene. Verstappen won the South Garda Winter Cup in the KF2 class, beating Dennis Olsen and Antonio Fuoco. At the end of 2012, it was announced that Verstappen would leave Intrepid. After a short stint with CRG-built Zanardi karts, Verstappen returned to the factory CRG team. He competed at the SKUSA SuperNationals in the KZ2 class in a CRG, finishing 21st. In 2013, Verstappen won the European KF and KZ championships. At the age of 15, Verstappen won the 2013 World KZ championship at Varennes-sur-Allier, France, in KZ1, the highest karting category. Verstappen's first experience in a racing car was at the Pembrey Circuit on 11 October 2013. He drove 160 laps in a Barazi-Epsilon FR2.0–10 Formula Renault car. The car was provided by Dutch team Manor MP Motorsport. He tested for several Formula Renault 2.0 teams in 2013. In December 2013, Verstappen tested a Dallara F311 Formula 3 car run by Motopark Academy. Another Formula Renault test came in December at Circuito de Jerez. Driving for Josef Kaufmann Racing, Verstappen went faster than Formula Renault regulars like Steijn Schothorst and Matt Parry. At the Circuit Ricardo Tormo near Valencia, Verstappen set a faster time than more experienced drivers including Tatiana Calderón and Eddie Cheever III. On 16 January 2014, it was announced Verstappen would make his racing debut in the Florida Winter Series. On 5 February, at the second race weekend, Verstappen won his first formula race at Palm Beach International Raceway after he started from pole. On 19 February, Verstappen won his second race at Homestead–Miami Speedway after beating Nicholas Latifi by 0.004 seconds. In 2014, Verstappen drove in the FIA European Formula 3 Championship for Van Amersfoort Racing. He finished his maiden car racing season third, behind champion Esteban Ocon and runner-up Tom Blomqvist, winning 10 races in the process. In August 2014, Verstappen joined the Red Bull Junior Team after testing a Formula Renault 3.5 car. He also considered an offer from Mercedes to join their driver development programme. Six days later, he was confirmed as one of Scuderia Toro Rosso's drivers for the 2015 season. It was confirmed that Carlos Sainz Jr. would be Verstappen's teammate, following Daniil Kvyat's promotion to Red Bull Racing. Verstappen chose 33 as his race number. By taking part in the first free practice at the 2014 Japanese Grand Prix, Verstappen became the youngest driver to take part in a Grand Prix weekend, as part of his preparation for a full-time place with Scuderia Toro Rosso in 2015. In January 2015, the FIA launched a new super licence system for Formula One, raising the age limit to 18 from the 2016 season onwards. Verstappen became the youngest driver to start a World Championship race by joining the sport a year before this licence restriction, in his Grand Prix début as a full-time driver at the 2015 Australian Grand Prix at the age of 17 years, 166 days – breaking Jaime Alguersuari's existing record by almost two years. In this first race, Verstappen won points-scoring positions until he was forced to retire due to an engine failure. However, at the subsequent race in Malaysia, Verstappen qualified sixth and finished the race in seventh place, scoring his first Formula One points aged 17 years, 180 days, breaking the record of youngest driver to score World Championship points. After that he then failed to finish with points in China, due to engine failure in the last lap, Bahrain, due to electrical issues, Spain, settling for 11th. At the 2015 Monaco Grand Prix, Verstappen was involved in a high-speed collision with Romain Grosjean, after clipping the back of the Lotus on the approach to Sainte Devote and flew nose-first into the barriers at high speed. Verstappen was given a five-place grid penalty for causing the accident, and was branded "dangerous" by Williams driver Felipe Massa – although Verstappen hit back at Massa by pointing out he had himself been involved in a similar incident with Sergio Pérez at the 2014 Canadian Grand Prix. Verstappen continued to regularly finish in the points as well as achieving his best finish of the 2015 season in Hungary by finishing 4th and equalled this result at the United States Grand Prix. At the end of the season, Verstappen received three awards at the FIA Prize Giving Ceremony, for Rookie of the Year, Personality of the Year and Action of the Year for his overtake on Felipe Nasr through the outside of the Blanchimont corner at the Belgian Grand Prix. Verstappen began the 2016 season at Toro Rosso, again alongside Sainz. Verstappen qualified fifth for the opening race of the season in Australia, but during the race made several radio calls to his team due to frustration at being behind Sainz on track before clipping his teammate whilst attempting to pass him with three laps to go, and he eventually finished tenth. Verstappen enjoyed a more successful weekend at the following race in Bahrain, finishing sixth to score Toro Rosso's first ever points at the Sakhir circuit. Following the Russian Grand Prix, Red Bull announced that Verstappen would be replacing Daniil Kvyat for the 2016 Spanish Grand Prix, with Kvyat returning to Toro Rosso. According to Red Bull Team Principal Christian Horner, "Max has proven to be an outstanding young talent. His performance at Toro Rosso has been impressive so far and we are pleased to give him the opportunity to drive for Red Bull Racing." After qualifying fourth for the Spanish Grand Prix, Verstappen rose to second behind teammate Daniel Ricciardo on the opening lap after Mercedes teammates Lewis Hamilton and Nico Rosberg crashed out of the race. Verstappen took the race lead as he was placed on a two-stop rather than the same three-stop strategy as Ricciardo, and he held off Ferrari's Kimi Räikkönen in the later stages of the race to take his first Formula One victory. By doing so he displaced Sebastian Vettel as the youngest driver ever to win a Formula One Grand Prix at the age of 18 years and 228 days. During the Belgian Grand Prix, Verstappen collided with Räikkönen at the first corner, pushed Vettel, Räikkönen and Pérez wide at Les Combes, and aggressively blocked Räikkönen on the Kemmel straight. Verstappen was criticised for his driving, with Räikkönen saying that he "was going to cause a huge accident sooner or later"; Verstappen's boss, Horner, said that the driving was "on the edge", and that "Verstappen will learn from Belgium". On 2 September 2016 F1 director Charlie Whiting called in Verstappen for a discussion. Whiting gave Verstappen a gentle warning because of his aggressive driving. However, in October drivers' concerns about Verstappen's defensive tactics led the FIA to disallow moving under braking. At the 2016 Brazilian Grand Prix, Verstappen qualified fourth. In a rain affected race, he barely managed to avoid hitting the guardrail when he spun on the main straight. After an additional tyre change from intermediates back to rain tyres, he ran in 16th place with just 15 laps remaining. Verstappen then made several overtakes in the closing laps to eventually finish on the podium in third place. He received considerable praise for his performance, with his team principal Christian Horner calling it "one of the best drives I've seen in Formula One". However, he came under criticism from Sebastian Vettel, who claimed that Verstappen had pushed him off the track when he gained a position on him at Junção corner late in the race. The race stewards did not share Vettel's view and decided that no reprimand was warranted. During the first 14 races of the 2017 season, Verstappen suffered seven retirements, four due to mechanical issues, and three due to first lap collisions in Spain, Austria and Singapore. Of the races finished, however, he claimed a third place in China, and another five races classified fourth or fifth. From the Malaysian Grand Prix onward, Verstappen enjoyed a surge of success. He won his second Formula One race at the 2017 Malaysian Grand Prix, one day after his 20th birthday, passing Lewis Hamilton for the lead in the early stages of the race. He finished second in the following race in Japan. He then finished third at the United States Grand Prix, but was classified fourth after his final lap overtake on Kimi Räikkönen was deemed illegal. He then won his third Formula One race (and second in 2017) at the Mexican Grand Prix, after passing Sebastian Vettel on the opening lap and leading until the end of the race. In the first 6 races of the season, Verstappen had been involved in at least one incident in each race. In Australia, he qualified 4th, but fell behind Kevin Magnussen at the start. In his attempts to retake the position he ran wide multiple times and damaged his car. He then spun at Turn 1 and fell behind Romain Grosjean, a recovering Ricciardo and Nico Hülkenberg. He then managed, due to strategy and the retirement of the Haas cars to salvage 6th place, coming home behind Fernando Alonso, who had jumped him in the virtual safety car period. At the next race in Bahrain, he crashed during qualifying and started in 15th place. He had a productive first lap after which he found himself in the points while challenging Lewis Hamilton. He attempted an overtake on the reigning World Champion at the start of lap two, but collided with the Mercedes driver and suffered a puncture that ultimately led to suspension damage which forced him out of the race. At the next race, in China, he qualified 5th and had moved up to 3rd at the end of the first lap. Both Verstappen and teammate Ricciardo pitted for fresh tyres during the safety car and left them with a tyre advantage over the front-runners ahead. Verstappen tried to overtake Lewis Hamilton around the outside of Turn 6 but ran wide and off the track, resulting in Ricciardo overtaking him. Once he had dispatched of Hamilton for 4th place, he tried to take 3rd from Sebastian Vettel but he collided with the championship leader, causing him to fall to 8th, while receiving a 10-second penalty. Following this he, once again, passed the struggling Mercedes of Hamilton for 4th and finished in that position. However, he still finished 5th due to his 10-second penalty. Meanwhile, his teammate Ricciardo went on to win the race. At the Azerbaijan Grand Prix, he was embroiled in a race-long battle with Ricciardo for 4th place. After the Australian had beaten him to 4th on the grid, Verstappen seized the position following an early safety car restart. Ricciardo challenged many times for the place and eventually succeeded in passing his teammate. However, Ricciardo, supposedly on the more favourable strategy, fell behind Verstappen after the pit stops. He then tried another overtake but Verstappen aggressively defended and ran into the back of the Dutchman's car, causing the retirement of both. The team blamed both drivers and the stewards reprimanded both drivers. Verstappen bounced back in Spain with his first podium of the season by finishing 3rd behind the Mercedes cars, holding off Sebastian Vettel. However, the race was also not without incident as he had run into the back of Lance Stroll during the virtual safety car period, damaging his front wing. The damage to his car was not severe and he held on to 3rd place. In Monaco, Verstappen made another error when he crashed near the end of the third free practice session in an incident which closely resembled a crash he had at the same spot two years earlier. His team could not repair his car in time for qualifying and he had to start last on a track which is notoriously difficult to overtake on.Daniel Ricciardo, meanwhile, pressed home Red Bull's advantage at the track by taking pole position. Verstappen managed to salvage 2 points by finishing 9th place, overtaking 6 cars on track. Team principal Christian Horner commented on Verstappen's start of the season, saying he "needed to stop making these mistakes" and that he could "learn from his teammate", who had won the race, while Dr Helmut Marko, head of driver development at Red Bull, said that Verstappen was "too impatient". Verstappen, following Monaco, lied in 6th place in the championship with 35 points, only 3 points ahead of Alonso in a much slower Mclaren, and 37 points behind his teammate in 3rd, who had taken two wins in the first 6 races. At the 2018 Canadian Grand Prix, Verstappen topped all three practice sessions and qualified 3rd, two-tenths off pole position which was won by Sebastian Vettel. At the beginning of the race, Verstappen pushed Mercedes driver Valtteri Bottas for 2nd place. However a safety car was deployed during the middle of the 1st lap caused by a collision between Toro Rosso driver Brendon Hartley and Williams driver Lance Stroll. He finished third in the race and set the fastest lap of the race on lap 65. The 2018 French Grand Prix brought him second place. At the 2018 Austrian Grand Prix, on Red Bull's home track, he started fourth on the grid, passed Kimi Räikkönen before taking advantage of retirement from Valtteri Bottas and a botched pit-stop strategy by Lewis Hamilton, who later had to retire in fourth place, to claim the fourth race victory of his career. During the 2018 British Grand Prix Verstappen was plagued by issues, finishing the first practice session early due to a gearbox problem and crashing in the second practice session before retiring from the race due to a brake problem. He would then finish 4th at the German Grand Prix, after strategy errors let a recovering Hamilton get past him as he went on to win the race. He ended the first half of the season with a retirement in Hungary and was narrowly behind his teammate in the championship due to his own recent resurgence and Ricciardo's unreliability. Verstappen enjoyed a very strong second half of the season, achieving podium finishes at Belgium, Singapore, Japan and the USA, the latter of which he achieved 2nd place having started from 18th on the grid due to a suspension failure in qualifying. Verstappen then earned his fifth career win in the 2018 Mexican Grand Prix. Verstappen had been visibly angry after just missing out on becoming the youngest pole-sitter in F1 history due to Ricciardo's quicker final lap in Q3. He, however, had a much better start than Ricciardo and took the lead of the race into the first corner, overtaking the fast-starting Mercedes of Lewis Hamilton. He was poised to win the 2018 Brazilian Grand Prix, having overtaken Kimi Räikkönen, Sebastian Vettel, Valtteri Bottas and Lewis Hamilton. However, he was hit by Force India driver Esteban Ocon who was trying to unlap himself on faster tires. Ocon received a 10-second stop and go penalty, the harshest penalty before disqualification. After the collision with Ocon, Verstappen finished in second place behind Mercedes driver Lewis Hamilton. During an argument with Ocon after the race, Verstappen pushed the Force India driver, for which he was given two days of "public service" as a penalty by the FIA. He then finished his season with another podium as he finished 3rd in Abu Dhabi. Verstappen holds numerous "firsts" in Formula One racing. In 2015, he became the youngest driver to compete in Formula 1 at the 2015 Australian Grand Prix for Scuderia Toro Rosso. He is also the youngest driver to lead a lap during a Formula One Grand Prix, youngest driver to set the fastest lap during a Formula One Grand Prix, youngest driver to score points, youngest driver to secure a podium, youngest Formula One Grand Prix winner in history, youngest multiple Grand Prix winner, youngest to win the same Grand Prix multiple times and youngest to win the same Grand Prix in successive years. ^ "Going full Gas in 2019". Red Bull Racing. Red Bull GmbH. 20 August 2018. Retrieved 20 August 2018. The Team is delighted to announce that Pierre Gasly will join us from the beginning of the 2019 season, to race alongside Max. ^ (in Dutch) "Jos Verstappen over de nationaliteit van Max (translated: Jos Verstappen about the nationality of Max)". Retrieved 13 June 2016. ^ a b Ostlere, Lawrence (15 May 2016). "F1: Max Verstappen wins Spanish GP after Lewis Hamilton and Nico Rosberg crash – live!". the Guardian. Retrieved 15 May 2016. ^ "Drivers / Max Verstappen". ESPN F1. Retrieved 20 August 2014. ^ a b Bonardel, Cécile (18 August 2014). "Verstappen's son in F1 in 2015". 24h-lemans.com. Retrieved 24 November 2014. ^ "Road legal at last! Verstappen passes driving test on 18th birthday". Formula1.com. FOM. 30 September 2015. Retrieved 30 September 2015. ^ "Verstappen moves out of home for Monaco". GrandPrix.com. 28 November 2015. Retrieved 17 May 2016. ^ "Limburgs Kart Championship – Mini-Junior 2005". DriverDB.com. Retrieved 27 January 2014. ^ "Rotax Max Challenge Belgium Minimax 2006". DriverDB.com. Retrieved 27 January 2014. ^ "Rotax Max Challenge Belgium Minimax 2007". DriverDB.com. Retrieved 27 January 2014. ^ "Belgian Championship – Cadet 2008". DriverDB.com. Retrieved 27 January 2014. ^ "Rotax Max Challenge Belgium Minimax 2008". DriverDB.com. Retrieved 27 January 2014. ^ "Belgian Championship – KF5 2009". DriverDB.com. Retrieved 27 January 2014. ^ "VAS Championship – Rotax Minimax 2009". DriverDB.com. Retrieved 27 January 2014. ^ "CIK-FIA World Cup – KF3 2010". DriverDB.com. Retrieved 27 January 2014. ^ "WSK World Series – KF3 2010". DriverDB.com. Retrieved 27 January 2014. ^ "WSK Euro Series – KF3 2011". DriverDB.com. Retrieved 27 January 2014. ^ "WSK Master Series – KF2 2012". DriverDB.com. Retrieved 27 January 2014. ^ "17° Winter Cup – KF2 2012". DriverDB.com. Retrieved 27 January 2014. ^ "SKUSA SuperNationals XVI – KZ2 2012". DriverDB.com. Retrieved 27 January 2014. ^ "Max rijdt rest van seizoen op CRG kart met TM motor". Verstappen Info Page. Retrieved 27 January 2014. ^ "Max Verstappen sensationeel in allereerste meters Formule Renault 2.0". RaceXpress.nl. Retrieved 27 January 2014. ^ "Verstappen: "Max al net zo snel als ervaren coureurs"". GPUpdate.net. ^ "Max op haar na snelste bij laatste FR 2.0 test van 2013". Verstappen Info Page. Retrieved 27 January 2014. ^ "Max fenomenaal snel bij zijn eerste F3 test op Valencia". Verstappen Info Page. Retrieved 27 January 2014. ^ "Max maakt autosportdebuut in Florida Winter Series". Verstappen Info Page. Retrieved 27 January 2014. ^ "Verstappen wint eerste autorace na regen en rode vlag". Retrieved 16 May 2016. ^ "Verstappen pakt overwinning in laatste race op Homestead". Retrieved 16 May 2016. ^ "Max Verstappen new part of the Red Bull Junior Team". FIA. Archived from the original on 24 September 2015. Retrieved 20 August 2014. ^ "Max Verstappen per direct opgenomen in opleiding Red Bull". verstappen.nl. Nu.nl. 12 August 2014. Retrieved 18 August 2014. ^ Meens, Stefan (18 August 2014). "Max Verstappen will make Formula 1 debut in 2015 with Scuderia Toro Rosso". verstappen.nl. Verstappen Info Page. Retrieved 18 August 2014. ^ Benson, Andrew (29 September 2014). "Max Verstappen: Teenager to drive in practice at Japanese Grand Prix". BBC Sport. Retrieved 29 September 2014. ^ "F1 teenager unfazed by baptism of fire in Melbourne fast lane". The Standard. Sing Tao News Corporation. Reuters. 13 March 2015. Archived from the original on 2 April 2015. Retrieved 15 April 2015. ^ "Max Verstappen to race with Toro Rosso F1 team in 2015". autosport.com. Haymarket Publications. 18 August 2014. Retrieved 18 August 2014. ^ Barretto, Lawrence (15 March 2015). "Lewis Hamilton beats Nico Rosberg to win". Autosport. Haymarket Publications. Retrieved 29 March 2015. ^ Johnson, Daniel (29 March 2015). "Sebastian Vettel picks up surprise win for Ferrari to blow world title wide open". The Daily Telegraph. Telegraph Media Group. Retrieved 29 March 2015. Max Verstappen took seventh to become the youngest points scorer in F1 history, at 17 years and 180 days. ^ Lawrence Barretto, "Monaco GP: Max Verstappen penalised for crash with Romain Grosjean", Autosport, 2015. ^ William Esler, "Max Verstappen hits back at Felipe Massa over Monaco crash criticism", Sky Sports, 2015. ^ Galloway, James (5 December 2015). "Lewis Hamilton & Mercedes officially crowned 2015 world champions". Sky Sports. Retrieved 5 December 2015. ^ "Max Verstappen: Australian GP shows moody side of Toro Rosso teenager", BBC Sport, 2016. ^ "Verstappen scores STR's first Bahrain points", GP Update, 2016. ^ "New line-up for Spain". RedBullRacing.com. 5 May 2016. ^ "Hamilton takes pole in Spain". www.bbc.co.uk. 14 May 2016. ^ "Formula 1: Max Verstappen gets under the skin of top drivers". 31 August 2016. Retrieved 4 November 2016 – via www.bbc.co.uk. ^ "Horner: Verstappen will learn from Belgium". espn.co.uk. Retrieved 4 November 2016. ^ "Italian GP: Max Verstappen given 'gentle warning' by FIA". 2 September 2016. Retrieved 4 November 2016 – via www.bbc.co.uk. ^ "Formula 1 outlaws moving under braking after protests over Max Verstappen". 22 October 2016 – via www.bbc.com. ^ "Formula 1 Grande Premio do Brasil 2016 – Qualifying". formula1.com. Formula One World Championship Limited. Archived from the original on 17 November 2016. Retrieved 17 November 2016. ^ Galloway, James (14 November 2016). "Max Verstappen stole the show in Brazil GP, says Mercedes' Toto Wolff". Sky Sports. Archived from the original on 17 November 2016. Retrieved 17 November 2016. ^ Gill, Pete; Esler, William (14 November 2016). "Max Verstappen's Brazilian GP drive hailed as 'one of the best ever in F1'". Sky Sports. Archived from the original on 17 November 2016. Retrieved 17 November 2016. ^ Edmondson, Laurence (14 November 2016). "Vettel: Verstappen move was 'not correct'". ESPN. Archived from the original on 17 November 2016. Retrieved 17 November 2016. ^ "Max Verstappen: Red Bull's reliability unacceptable". ^ "2017 Formula 1 Japanese Grand Prix - Race Result". Formula1.com. Formula One World Championship Limited. Retrieved 24 October 2017. ^ "2017 Formula 1 United States Grand Prix - Race Result". Formula1.com. Formula One World Championship Limited. Retrieved 24 October 2017. ^ "Formula 1 Gran Premio de México 2017 - Race Result". Formula1.com. Formula One World Championship Limited. Retrieved 29 October 2017. ^ Mitchell, Scott; Cozens, Jack (25 March 2018). "Early damage a factor in Max Verstappen's Australian GP spin". Autosport. Motorsport Network. ^ "Verstappen's right foot caused Bahrain crash". Eurosport UK. 13 April 2018. ^ Gill, Pete (9 April 2018). "Bahrain GP: Sebastian Vettel holds off Valtteri Bottas for victory". Sky Sports F1. BSkyB. ^ Mitchell, Scott (15 April 2018). "Chinese Grand Prix: Ricciardo wins, Verstappen and Vettel collide". Autosport. Motorsport Network. ^ Galloway, James (30 April 2018). "Max Verstappen, Daniel Ricciardo reprimanded for all-Red Bull Azerbaijan GP crash". Sky Sports F1. BSkyB. ^ "WINNERS AND LOSERS - Spanish Grand Prix edition". Formula 1.com. Formula One World Championship Limited. 14 May 2018. ^ Mitchell, Scott (26 May 2018). "Monaco GP F1 practice: Ricciardo fastest as Verstappen crashes in FP3". Autosport. Motorsport Network. ^ a b Benson, Andrew (26 May 2018). "Monaco Grand Prix: Max Verstappen crash 'unnecessary', says Red Bull's Helmut Marko". BBC Sport. ^ Mitchell, Scott (27 May 2018). "Monaco Grand Prix: Daniel Ricciardo wins despite car problem". Autosport. Motorsport Network. ^ Freeman, Glenn. "FIA gives Max Verstappen 'public service' for Esteban Ocon shove". Autosport.com. Retrieved 12 November 2018. ^ Richards, Giles. "Max Verstappen becomes youngest man to drive a Formula 1 car". The Guardian News and Media Limited. ^ "Max Verstappen I'm the youngest race-winner in F1 history". Retrieved 2 April 2017. Wikimedia Commons has media related to Max Verstappen.